A quick mixed-media abstract landscape from last weekend out of my art journal. Brought to you by Inktense blocks, colored pencils (I think), watercolor paint and acrylic craft paint. I’m reading a book that I’m hoping will help me to create more depth in my abstract work, working toward abstract realism. “Abstract Art Painting: Expressions in Mixed Media” by Debora Stewart was published earlier this year, and you can check out a preview of it at this link. 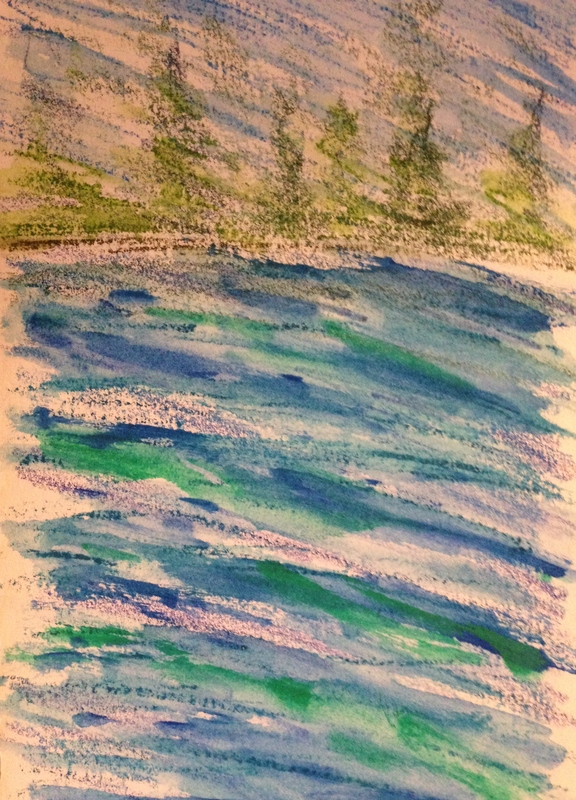 Debora is primarily a pastel painter, but I’m finding that her tips about how to pursue abstractions would apply to an artist working in any medium. Happy Friday, and as always, thanks for your visits and comments. Peace. < Rough & Ready Roses? Abstract is our theme of the day. 😊. Beautiful serene setting you created. Thx Jodi. So therapeutic. Just what we need, eh? Thank you so much, Johanna; you’re so kind! Wow, thank you, Charlie! Oh, I hope you do. You have a wonderful sense of color and I think your work would be beautiful! You always have such interesting recommendations. 🙂 I’m not usually interested in drawing abstract (it doesn’t lend itself well to illustration work) but I want to check out that book anyway. Happy Friday! Wonderful, Teresa; I hope you enjoy it! Your abstract sketch, using different mediums, gives me a few creative ideas this morning. Thank you! I do hope your kitty is feeling better. We finally found a food she will go after and her antibiotic seems to be working, so I feel encouraged, Sharon, thank you! I’m so glad to give you an idea you can use and I can’t wait to see it! Have you ever worked abstract, Sharon? I haven’t worked abstract, maybe I should give it a try. Good news about kitty. Gosh I like what you are doing here, Laura. I love the image you’ve produced. Thank you so much, Kirk! I was looking for something to post and I almost didn’t…..I’m really glad people seem to be enjoying this so much. I was definitely searching for peace in this painting and I think the reason I’m gravitating toward abstraction right now is that I’m finding it in my artwork. And that’s so important. Thanks for your comment, as always. That is a peaceful place, that painting. A lovely experiment Laura! Thanks for the book recommendation too! 😊 Happy Friday! Thank you, Jill, and as long as Penny keeps eating and drinking, it will be for sure! I hope she does. Are the antibiotics helping her? Thank you so much! I really believe the prayers are making a difference. My insomnia has got so much worse since she got sick, so just getting a good night’s sleep would be wonderful too. Hub sleeps like a rock. A is coming home to see her four-legged sister this weekend too, so that’ll be nice. 💛💛💛 Yes, getting them to take the medicine really is tough. Prancer was impossible; he was just too strong. Penny is much easier. Take care, Jill. Thank you for the suggestion Laura, nice experiment with wonderful energy! Thank you, Mary! I’m really drawn to abstract work right now. I apologize if I’ve asked you this before, but have you ever worked abstractly? I haven’t, but good question. I don’t know if my mind is wired for it – perhaps one day you’ll see a few experiments from me. Okay – one day wayyyyyyyyyy out into the future! Lol, Ms. Stewart’s work has inspired me so much! It is just gorgeous and you are so talented. I agree it’s not for everyone, though. Lovely work – I’ll check out the book – I need some inspiration… ! Thanks, Evelyn; I do hope you enjoy it! Interesting ~ thanks for the book recommendation. Will look forward to hearing and seeing what you discover. Peace! Thank you! Her work is such an inspiration. The book is great, but her paintings are the best part.